Mobile applications have invaded mankind to the extent that today one cannot even imagine living without them. So much so, that you have to decide which mobile app you would like to use for your need? 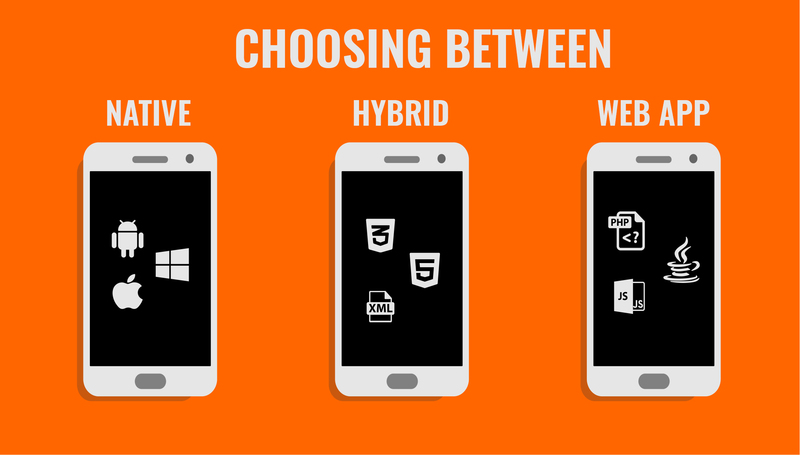 The major question is native,hybrid or web-which one to choose? For a layman, a mobile app is something which simplifies their work just by a click of a button of their mobile. To define it more precisely mobile applications or simply mobile apps are a computer generated program or software applications which are built to run on various mobile devices like- iPhones, Smartphones, and tablets. They are so common these days that it is another way around if a smartphone doesn’t have the “popular apps” it is considered as “OBSOLETE”! Planning to Develop a Mobile app? If you are planning to develop a mobile app for your business and you are not technically sound on the subject, the challenge is to decide on the type of mobile app. The success of your mobile app depends on factors such as technical details, business needs, design, marketing, and branding. Of so many factors, the most critical is the selection of app type, as changing the app type at the last moment can cost you, and wrong selection can ruin your project. To speed up the app development and take the advantage of right selection for long you must first understand your needs and the various kinds of available apps. Apps can be broadly classified into Web, and Mobile Apps. 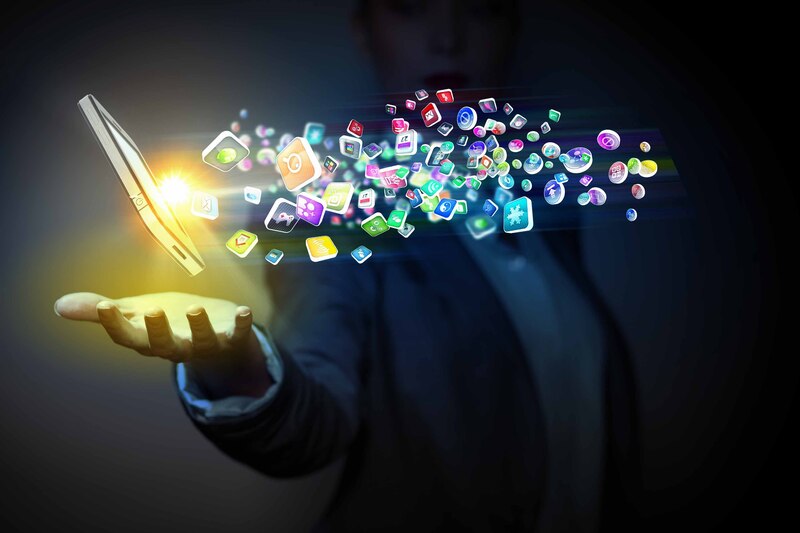 Mobile apps can further be divided into Native and Hybrid Apps. Each has their advantages and limitations, which you must understand and select your choice. When an application is accessed using a web browser over a network like an internet, it is termed as- Web App. Unlike websites which are informational, they are functional and need not be downloaded like mobile apps. They are loaded on browsers like Chrome or Firefox and do not consume memory or storage space on the user’s device. In short, they can be understood as websites with interactivity and functionality. As web app can be used on any mobile device that has a web browser, be it iOS, Android, or Windows, it needn’t be written multiple times for each platform. Single code base across platforms.Distribution, deployment, and updates or features can be released instantly, as they need no updating on an app store. Interactions are not so neat and responsive when compared to other apps. UI design elements can be inconsistent.Device-level features like push-notification, work offline, and load on the home screen are not supported. As they are unavailable in “App Store” the potential reach to users slip down. Slow operating and cannot be accessed without internet. Mobile apps can be downloaded from an “App Stores” and are of two types, namely- Native and Hybrid Apps. Apps created, designed and coded for specific platforms, like iOS, Android, and Window phones are native apps. They are more complex when compared to web apps, in terms of the fact they take account of the software language used in the device, development tools required for them, user interface elements needed, and software development kits (SDKs). Hence, one native app created for one OS will not run on the other. That implies if you wish to develop native apps for iOS, Android, and Windows you need to create separate apps. Unlike iOS devices, Android devices have the “back button” hence they do not need separate UI element for this. Native apps are released and distributed via an “App Store” which has its pros and cons. On one side, the user gets access to hundreds of apps at a single location, which makes it easier to install. Each of these platforms has its own publication procedure, therefore, for an update or new feature, it can take from few hours to few days for completion. Superior user experience in terms of speed and responsiveness. All device-level features are accessible. Available in an App store hence marketing easy. Least use of hardware and efficient coding. Different code bases required for different platforms. Prior approvals required in case of “Apple App Store”. Maintaining and updating are demanding. As many developers may be platform specific, you may need to invest in two separate developers if you wish to launch on multiple platforms with Native apps. As the name itself says- it is an amalgamation of Native and Web App. They get installed as Native App and feel like Web apps. Hybrid apps are good MVP options as they can be created in short span of time, with limited resources and can be launched for testing and feedback. In short, they are native app codes coupled with web technologies and published via a relevant native app store. Developers prefer creating web apps as hybrid apps as doing so allow them to integrate device-level features like push-notifications or camera. At the same time, they also get the chance to be accessed on App store, Google Play or Window store. Developers are always happy to build a hybrid app as they need to write single web technology code base, which can be deployed into multiple devices. Convenient, fast and cost-effective to build, using standard web technologies. Apps can be marketed in app stores. Allowed access to device’s APIs, can access storage, camera and much more. As they load in a browser like an element they have poor performance, i.e., less responsive. The UX is usually compromised. Submission (for iOS) is required for the relevant App store. Dependent on a third-party platform. Now that you are clear on the definition of Web and Mobile apps, you would agree that Mobile Apps are far more user-friendly, fast, easy to access and have great functionality. 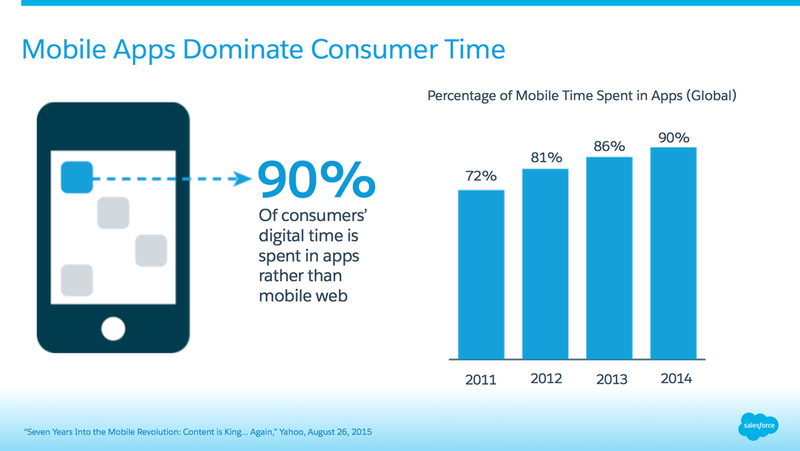 It is estimated that 90% of user’s digital time is spent on mobile apps rather than the web. – Can work on both online and Offline modes. You got it correct- The Native Apps. 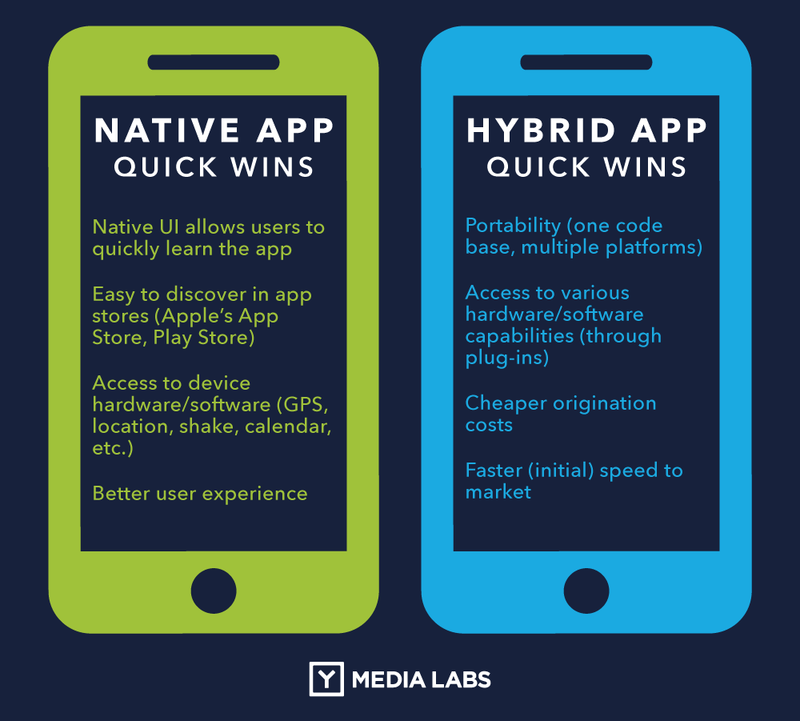 Though hybrid apps do have qualities like single code base, cheaper origination costs but when accounting for the peerless features of Native apps they fade away. For your and the app’s success, you must take out some time to decide the kind of app your business actually needs. You have a core purpose of developing an app, therefore the mobile app needs to match that purpose. While you do so you purposefully keep the focal point of your mobile app in the pain areas of the audience. Secondly, that secures that the features and capabilities will be audience-friendly. Cost of your platform greatly depends on the type of app you choose. You cannot play with all kinds of apps and then finally come to a conclusion. You must choose before you hit the deck. This way you stick to your intended budget for the mobile app. App development doesn’t end at the end of the creating it, in reality, it starts from there. It requires long-term dedication and you need resources for the maintenance, updates, and future up scaling. Therefore, choosing the correct app will guide you to align your resources accordingly. With so many positives and negatives of each kind of mobile app, it is quite challenging, rather confusing, to decide which one should you go for. The following will guide and facilitate you to finalize. User experience cannot be compromised, and hence you must account for it while making a decision. If required you may write two separate native apps, one each for iPhone users and one for Android users. Consider these two most important factors as you have to choose from a large range and each has its cost, complexity, features, and platform. You need to evaluate which one to discount or you do not have a scope of discount. You may even decide to hire an agency to decide on this factor for you. You may decide to hire freelance developers or employee developers from across borders. To decide on that, you must research on the cost you need to pay for the same. Hiring from developing countries or emerging states like India or Eastern Europe, where the average cost range from$30 to $50 an hour, can be cheaper. Developers in the US may have an average cost of $150 an hour. Time taken to create an app is shortest for Web apps. The longest time to create an app is for native apps. Native apps might take extra time as they need time for two separate ddevelopment procedures one for Android and one for iOS. Native and Hybrid apps need to go through the submission and approval process in relevant app stores (Apple App Store). Develop apps based on the kind of audience you plan to target. This can be explained with an example. Say, you wish to launch your apps with an audience, that needs updates very frequently. In such case, you must go for either Hybrid or Web apps as native apps will consume time to update. If your target audience needs easy access and downloading you must go for native or hybrid apps as only they work offline. The features you wish to keep in your app will also decide the kind of app you should go for. Different apps have different ability to use device’s native APIs. Some apps are functional irrespective of the phone features. Some others might need consideration in this case. Apart from this, you should also consider any feature you wish to add in future. 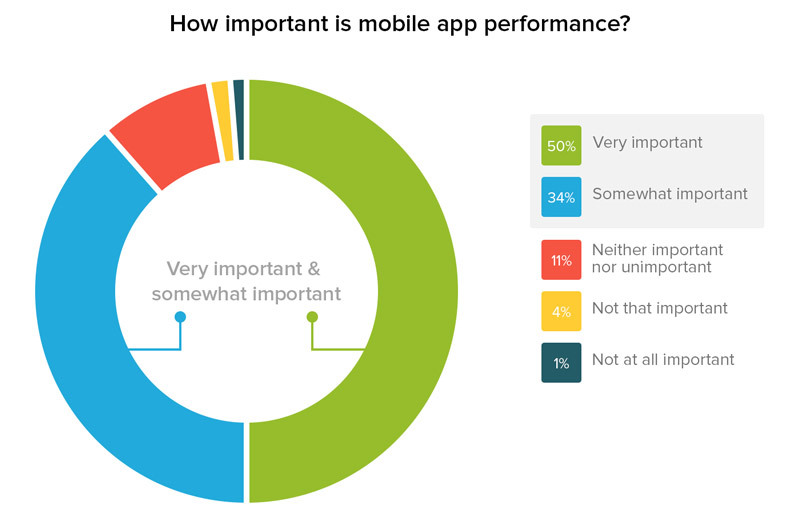 Experts agree that around 84% of users consider app performance as an important indicator for their selection. When to or When not to! You wish your website to be displayed on mobile devices with ease. You don’t want extra mobile native functionality. You wish to display your content on mobile platforms like iOS, or Android. Native mobile functionality is not the need. Target is only iPhone or only Android or only Windows users. When accessing device functionality is the need. When performance, view, and compatibility are the prime objectives of a specific ecosystem. No need for specific native functionality. Performance is not an issue. Budget and time is a concern. Multiple platforms are the objective. Developer skill sets are limited. How soon you need the app? – The API infrastructure you offer must be reliable, and accessible. – A mobile app is always an extension of your brand. “Nobody has Time for Bad Experience”! The key to a successful app is the user experience. That’s why the most successful apps look completely different to what they used to 10 years back. 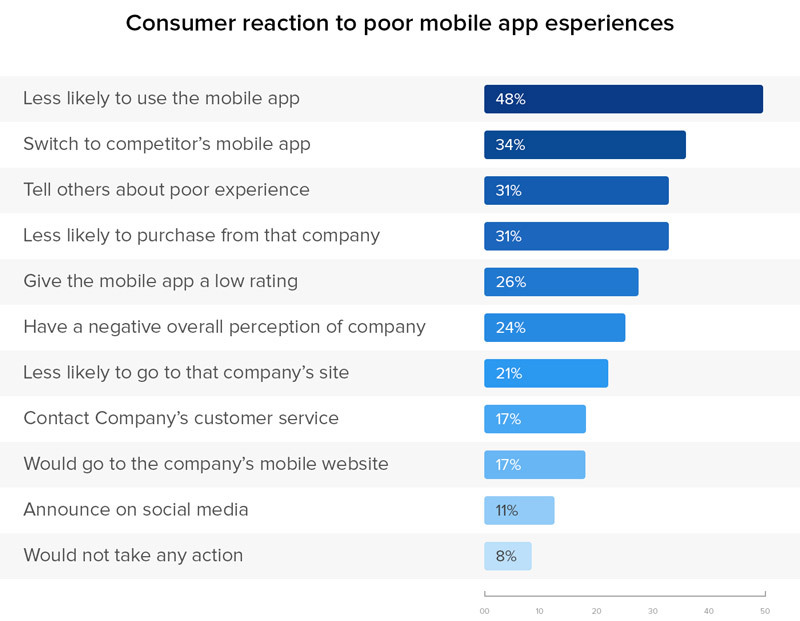 No doubt on all user-experience parameters Native app score higher than the Hybrid app and one must give preference to a Native app while choosing. Most of the above criteria are been fulfilled by native apps and that makes them the most populous and in-demand mobile apps of the times. You may employ the best developers to build your native app or may hire the master like- EngineerBabu to do the job for you. As can be seen, EngineerBabu is the “One-Stop” solution for all your App related concerns. EngineerBabu helps startups, enterprises, and owners to grow their business by building high class IT solutions. 95% of projects developed by them were completed on-time. Set your priorities and act accordingly, if budget is priority opt for web or hybrid. If the priority is brand experience and you are confident that user experience will fetch you the dividend you must choose native apps. The speed, responsiveness, and the spectacle will be unmatchable.